Driving on I-4 and in the surrounding areas during the I-4 Ultimate project will take some planning on your part. Here we’ve consolidated all the information you might need to make your commute easier. Be sure to sign up for route-specific email and text alerts and real-time traffic updates. SunRail is a great alternate mode of transportation and will help relieve congestion throughout I-4 Ultimate construction. The newest option for commuters in Central Florida first launched in May 2014. SunRail, which is available throughout the day Monday through Friday and recently expanded to include late-night service, offers a great alternative to driving on I-4 during construction. 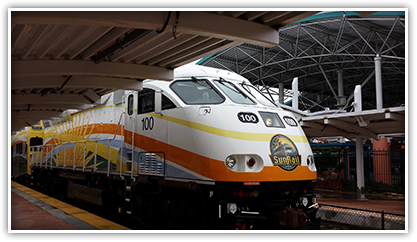 To find out more information about SunRail, its schedule, ticket information and more, please visit www.SunRail.com. LYNX provides more than 105,682 rides each weekday. Be one of those riders during I-4 construction and help reduce congestion! 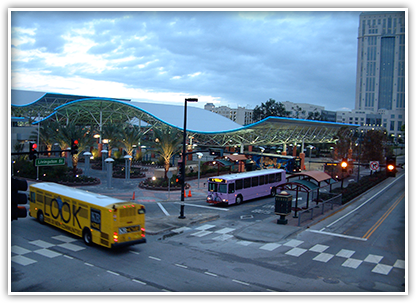 The LYNX Central Station in downtown Orlando is a busy transit hub with lots of options to get you where you need to go. With more than 100,000 riders every weekday, LYNX has been a leader in Central Florida public transportation for many decades. With stops throughout Orange, Seminole and Osceola counties, catching a LYNX bus is one option to avoid I-4 construction. For more information, go to www.GoLYNX.com. Orlando Bike Share offers hundreds of bikes in the downtown area that can be used to commute, run errands and much more. Looking for some help with that last-mile commute in Downtown Orlando? Orlando Bike Share is a great option for SunRail or LYNX riders who prefer not to walk or drive the first and last leg of their commute. With over 200 bikes available, Orlando Bike Share helps fill in gaps between Central Florida’s growing public transit modes and provides A to B connectivity. Bikes can be reserved using your cell phone, your desktop computer or at a hub. Visit orlandobikeshare.com to learn more about this program.